The Bearded Collie's temperament tends to be ostentatious and fun to be around. It is a very lively, playful, breed and it constantly very full of energy. It has a large enthusiasm for life in general and loves to play. It can be very independent but tends to be extremely trainable and once trained, it is a very obedient dog. It has a wonderful sense of humor that can often be looked at as being clownish. This tends to make the breed even more lovable to its family. It loves children, but as always, like any dog, should be carefully watched when playing with young children to avoid any accidents. This makes a great family pet and it is very loyal to its owner and its family. It does not warm up to strangers immediately, because of its protective nature, but given time and once it becomes familiar with the stranger, it tends to warm up and become friendly. The physical demands on this breed are evident, however, it does not need the constant physical exertion that other breeds may require. It is important to ensure that this breed gets its daily dose of exercise, but this should be obtainable with either a good, semi-strenuous jog, or a long walk. These dogs are also great hiking companions and love to explore the outdoors on a good, long hike. Vigorous play sessions and game are also recommended as a valid form of exercise. Because of this dog's stamina and love for a challenge, herding is something that Bearded Collie's are exceptionally good at. Although this breed could survive while living in the great outdoors, it is typically recommended to live indoors with its family inside of a warm house. Its coat can become very tangled and matted, so it is important to vigorously brush its coat at least every other day to avoid getting too tangled. If its coat does get too tangled, it can be very uncomfortable, perhaps even painful, for the breed, and sometimes its matted hair may effect its site if it is too close to the dog's face. 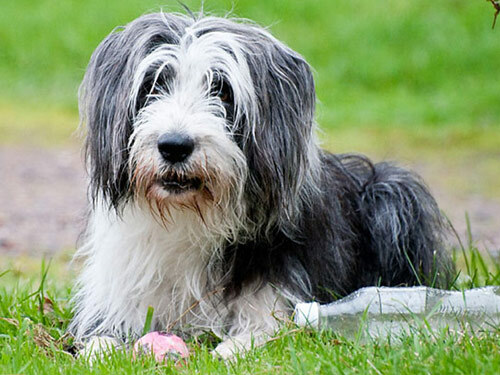 The Bearded Collie lays victim to a variety of health concerns that tend to target the breed. However, the good news is that almost all of these health concerns are only minor concerns and not major concerns. The minor concerns include CHD, Chronic Hip Dysplasia, which can actually be quite serious if not treated in the correct amount of time, epilepsy, colonic problems, and Addison's. There are a few others that tend to pop up, but those are the majority of issues. CHD, PRA, PPM, and vWD are all only occasionally seen in the Bearded Collie. This means that if you are an owner, you should get your dog tested on a regular basis to ensure that its health is constantly meeting the standards of your vet. Eye tests, hip tests, and thyroid tests should be performed on your dog on a fairly regular basis in order to track its health. If healthy, this breed can live anywhere from 12 years of age to 14 years of age. The Bearded Collie is believed to be a derived from the Magyar Komondor or the Lowland Polish Sheepdog. In 1514, records reflect that there were two Lowland Polish Sheepdogs that were brought to Scotland that very much resemble Bearded Collies. The AKC recognized the breed in 1977.